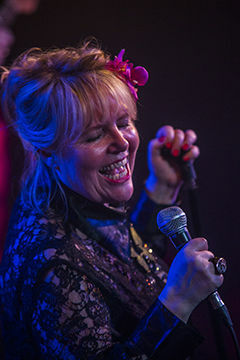 “Connie Lush has been recognised as one of the finest Blues singers in the UK, winning five times, ‘Best Female Vocalist UK’ earning a place in the gallery of greats, alongside Alexis Corner and Eric Clapton to name just two. Twice voted ‘European Blues Vocalist of the year’ by the French Blues Trophies Awards and nominated again ‘Best UK Blues Vocalist’ 2011-2012. “In recent years, Connie has performed in over 30 countries. She has played at some of Europe’s largest and most prestigious festivals, including Glastonbury Festival 2011 and wowing audiences in Moscow, New York and LA, recording in The Cotton Row Studios in Memphis and of course singing at BB Kings, Beale St…. Connie also toured with BB King through the UK, finishing at The Royal Albert Hall London. Connie has contributed a hat worn on stage for display at British Blues Exhibition events.